A Great Art Gift! Seasoned Hardwood•Adjustable Canvas Height•Easy Access Drawer•Carrying Handle•0-90 deg. Angle Adjustment. Take your art with you wherever you go! 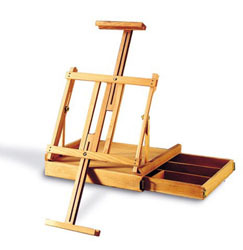 This portable easel holds your canvas and your supplies. Unfolds for use on any steady surface and locks snugly for travel. Maximum canvas height 34". Base width and depth: 16"x14" Weight: 7 lbs.14 oz Folded dimensions: 14"x16"x5"
Road scholars, think of this as your own personal think tank that goes wherever you do. A drawer holds the implements of your work - pens, papers, highlighters, whatever; while a pop-up easel stand holds open your book, journal, or sketchpad. Crafted of hardwood with leather handle. 13 1/4" x 10 1/4" x 2 3/4". Best's Caballo Bench Easel - You will find no better bench! A remarkable easel that does everything and goes anywhere. Attached wheels offer mobility when the bench is folded up. When it is set up, the unit provides a sitting area, a storage drawer and an easel for sketching or painting. For years Italian bench/easels made of beechwood have been popular in the States. Now this Old World favorite is not just made better, but the BEST! 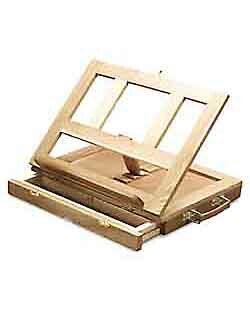 This all purpose easel is ideal for the oil, watercolor, pastel, airbrush, or acrylic artist. Whether sitting or standing, a full range of angles (from vertical to horizontal) is possible. And, the front wheels make transportation easy. * Will hold canvases up to 72" * Elegant single mast design. * Folds flat for easy storage. * Top, bottom, & middle painting trays have rubber grips to keep the canvas secure. * Minimum vertical easel height: 50". Maximum height: 90". * Table height: 37 1/2". * Base measures 17" wide by 16" deep. * Bottom shelf for storage. * Ship wt: 35lbs. Ships partially assembled. * Ships UPS.